Four months ago a call went out at Cedar Ridge High School near Dell’s main headquarters. More than 200 students came to hear about a project our Dell Education team was sponsoring to create the library of the future. This week the 22 students who took on the challenge presented their vision to leaders of their community, their school district and Dell. The team was tasked with the challenge of designing for both an elementary school and a city library, and they said they quickly learned through a Google search of “library of the future” that there was a lot of greenfield in which to work. There was so much freedom to explore all possibilities, in fact, that reigning in all the ideas was actually one of the difficulties the team said they had to overcome when I asked them about obstacles faced. “We have such different minds it's really hard to collaborate,” one of them also admitted. With a large group spanning multiple grade levels working together to imagine, create, and define what these spaces would look like, and the impact to those who use the space, that was the answer I had actually expected. But to break it into more manageable pieces, the team decided to divide into five groups to focus on the elements of architecture, engineering, interior design, business/finance and the design of a web page to bring it all together. “Everyone knew what they had to do in their group, and then we came together to complete the project,” said Devin DeAnda. Inspirational field trips to an elementary school library, discussions with public librarians in their community, as well as the guidance of the six teachers who participated, helped the students understand the importance of taking other people’s ideas into account, rather than simply making decisions based on their own preferences. This project not only gave them a chance to contribute in areas of their strengths, but also to learn about skills they might not have realized they had. Participants said they were able to make personal discoveries about what they are good at and what they want to do in the future. As the daughter of a librarian, myself, I was heartened to hear that they saw a strong future for libraries. Their vision was for libraries to be more than just a place to come in, read a book, and walk out. The architecture team even took into account the need for passersby to see into the building and be intrigued to come into it as a community space. The café with food and drinks they suggested adding won’t hurt either. The students were happy to hear that their hard work – which was completely volunteer and did not earn a grade – was being taken seriously by the business, community and school leaders in the room. "What I enjoyed most about hearing their presentation was all the skills they used that I know will be needed to be career and college ready," Dell teammate Snow White, who worked with the students throughout the project, told the Round Rock ISD team. You can view the full presentation with photos and research, on their Cedar Ridge “Library of the Future” website. Kudos to the students who did an amazing job thinking "outside of the box" as they created their vision for the future of libraries. Also, thanks to the impressive turnout of Dell Executives, RRISD administrators and community leaders who attended the presentation. The kids were thrilled to see all of the support! It is nice idea to make E-library which is economical friendly and easy to use by the student. 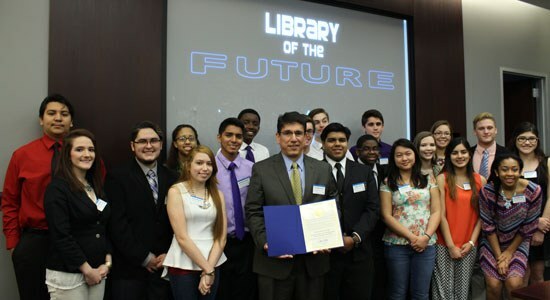 Library for the future is great project controlling by the Dell. Students will made happy by E-library and will learn through out internet…good job by Dell.